What's in a name? 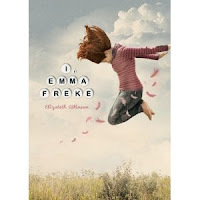 I, Emma Freke is a charming search-for-identity story about Emma―the only "normal" member of her quirky family. Her flighty, New Age mom seems to barely have time for a daughter, especially one who annoyingly spoils her mom's youthful façade. Emma's well-meaning grandpa is clueless. And her only friends are the local librarian and a precocious 10-year-old adopted by the two old ladies next door. Smart, shy, and nearly six feet tall, Emma struggles to fit in at school, so she jumps at the opportunity to "home school" until that too turns into another of mom's half-baked ideas. The real crisis comes when she gets an invitation to The Freke Family Reunion, and her fellow Frekes aren't at all what she expects. While Emma desperately tries to find her niche, she discovers that perhaps it’s better to be her own "freak" than someone else's Freke. Life used to be easier for Emma. She used to be younger, shorter, and dumber. Then one summer she grew and her brain practically exploded with knowledge, leaving her close to six feet tall by the time she was 12 and disinterested in anyone her own age. Oh, and as if that isn't bad enough, her New Age mother, Donatella, stuck her with a name that if said slowly comes out like, "Am a Freak." Then a mysterious letter comes inviting Emma to The Freke Family Reunion at a campground in Wisconsin...where she finds out that her last name is pronounced Frecky, and meets more relatives than could imagine! Perhaps this will be her chance to learn more about herself. But surprises await Emma, and she's not sure if being someone else's Freke is right for her. From the very first page, Atkinson establishes Emma's voice and it never falters. A tiny bit sarcastic, feeling like she is the adult instead of her mother, angry that Donatella refuses to answer questions about her father, and with only one true friend, Emma certainly has things tough. She's also certain her mother never said her name aloud before putting it on her birth certificate, because who in the heck would name their kid something like that? Emma is sympathetic, but she's also funny, which helps to pull the reader into her story. I doubt you'll feel the need to shed any tears over this one, though in some ways Emma's life is rather tragic. Stuck working after school at her mother's bead shop, often left with her Nonno (grandfather) and his disgusting dog, Eggplant while Donatella goes out on numerous dates with a variety of guys, and freakishly tall with flaming red hair, you keep wondering if Emma will ever catch a break. In addition to Emma, some of the Freke cousins provide a healthy dose of entertainment. If you've ever attended a family reunion, those chapters might cause you to shout out, "It's just like that!" I know that if my family ever had a reunion, it would play out just like this...a crazy aunt, the outcast family members, and more! A masterfully told story, I, Emma Freke will resonate with many tweens. Atkinson has captured exactly what it was like to be Emma, and that will have readers flocking to stores to pick up this book and read it over and again. I just absolutely loved this book! The author did a phenomenal job of connecting you with the character Emma Freke. I just hope that there are more books to come! I could definitely see this book made into a film someday. I would recommend this book to ages 10 and up (adults too!). To learn more about the book click here. You can buy this book on Amazon (avail. November 2010).